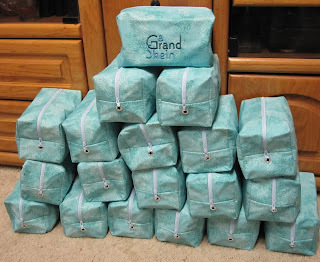 I finally got the dopp kits for A Grand Skein done!! I made 30 of the them. I was happy with the end result, even though I forgot to put the little pull tab on the ends! It doesn't show in the photo but the zipper color that we ended up with wasn't a great match either. It was more of a light blue than a turquoise color. Now I'm making some snowflake ornaments for my friend Adrienne.